This bright spacious family home is located in a quiet cul-de-sac in Linburn, Erskine. The home has been well-maintained by the homeowners and in walk-in condition. The home comprises of entrance hallway, front aspect lounge with under stairs cupboard, leading through to the dining kitchen this has been modernised with white high gloss cabinets, integrated appliances, large storage cupboard and French doors which lead out on to the patio. 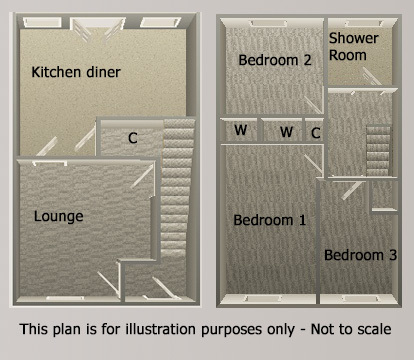 On the upper floor is 3 spacious bedrooms all with built-in wardrobes, shower room and storage cupboard on the landing. The front of the property has a mono-bloc driveway which leads through gated access to the secluded rear garden. Here you will find the garden is a sun trap and laid to a large patio and lawn.